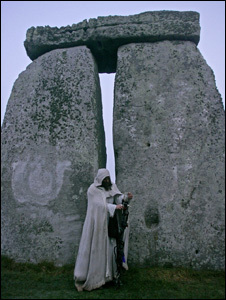 Stonehenge: Could 2011’s solstice mass event be the last? As we recently observed people are fully entitled to see Stonehenge as their temple. However, while such claims are harmless in themselves they have also been responsible for some unwelcome effects. For isn’t it clear that a wish to avoid offending people of a spiritual nature has led to a reluctance to say that no, access by tens of thousands of revellers at Summer Solstice is unseemly and damaging and really must end? 2. Spiritual people yes. Of course. But in limited numbers, selected by ballot from the membership of well established pagan organisations. 3. Other people (whether non-spiritual or spiritual but without demonstrable group affiliations), yes of course and also in limited numbers, selected by ballot from those who apply. So how many in total? That’s entirely EH’s affair, depending purely on how many they think can be safely and sensibly admitted without imposing a risk of damage or broadcasting an image to the world that we don’t treat Stonehenge as it should be treated. It’s certainly time they decided what they could cope with rather than unsuccessfully trying to cope with many times more than they can! So let’s SHARE Stonehenge, it’s the obvious thing to do. But not abuse it, which is also obvious. If spiritual people agree to that and people in general agree to that (following a consultation) then English Heritage could surely have a mandate to make radical changes to what happens at Stonehenge as soon as next year? Move the party. Everyone seems agreed that Durrington Walls was the meeting place for the pre ceremonial parties. For my part I would love to see and present to the world a proper cultural celebration of the solstices. Party somewhere else, and then a flaming torch procession to the stones with the spiritual leading the ceremony. Speaking as a local artist inspired by the spirit of the stones, I believe that it is the essence that is missing from the ‘Stonehenge Experience’ . What should be a beautiful, cultural and spiritual experience offered to the world is still just a focus on mad drunkenness, littering and arrests. I always enjoy going to the open events at the stones but always feel just a little bit sad that we really have got it all wrong.